Built 1904 by Neakle & Watterson of Peel, Isle of Man, she was actually launched on Christmas Eve (1904), but first registered as a fishing boat in PEEL, as PL5 on 18 January 1905. She was built for a PEEL fisherman called George Gaskill of 7 Patrick St, who previously had an open 32 footer called the BEE. The Fishing register shows her as having fished for Herring and Mackerel between 1905 and 1906, with a crew of 4 men and a boy, in 1907 for Cod with lines and in 1908 herring and mackerel, a note on her fishing papers shows that her crew were all Peel men in 1910. There is a photograph showing her during this time sailing in Peel Bay with her full working rig set and the old bathing pool in the background. Another photograph shows her at the top of Douglas Harbour in company with two other Drifters. 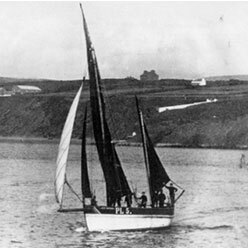 On the 20 th February 1909 White Heather's yawl (tender) was called to assist two fishermen who were recovering the body of Robert Cannell who had fallen into Peel harbour while boarding the GLEE MAIDEN PL139. Cannell was put over a barrel to enable the seawater the man had swallowed to come up. This brought Cannell to, and the Police took him to the police station. † Cannell was stripped and hot water bottles applied to his body, after an hour life came back to him and after a few days the lucky man was fully recovered. Sometime around 1910 she was said to have been fitted with a small bronze cannon aft on her quarter for the purpose of repelling the fierce Kerry men. Whilst on the Kinsale fishery, the Kerry men † had a tendency to row silently up to the drifters at night whilst crews slept, climb aboard and steal any loose gear. Apparently this device languished in a Peel 'Thie Veg until the 1970's when a collector offered to buy it unseen. The cannon could not be found, the owners wife had thrown it into the dustbin years earlier. On 3 rd March 1913 she was sold to Mr James Palmer of PORTAVOGIE County Down, Northern Ireland, and re-registered as B504. C1918 a 14Hp Kelvin auxiliary engine was fitted, during the war this was replaced with a five cylinder Gardener engine, large enough to make her a fully motorised vessel but carrying a steadying sail on the mizzen. Palmer and his two sons William and James Jr. appear to have owned her till C1945. On Tuesday 21 st May 1913,George Gaskill launched a new White Heather, this time an auxilliary Nobby, again PL5, (46' x 14) but fitted with a 15-20hp Kelvin engine. She allegedly made 12 kts during trials and caught her first herring at the end of the week. On the 19 th June 1914 she was renamed MANX GIRL (PL5). On the 7 th March 1924 she was sold to John Garvey of Tralee Dingle(T1). During Palmer's ownership of the original White Heather at the time of the Great War, she was reputed to have been fishing with the County Down fleet off the Anterim coast when a U Boat surfaced, the U Boat crew ordered the crews of the remaining boats into White Heather and two others, and then proceeded to sink the boats with gunfire. This action resulted in the loss of 28 fishing vessels. 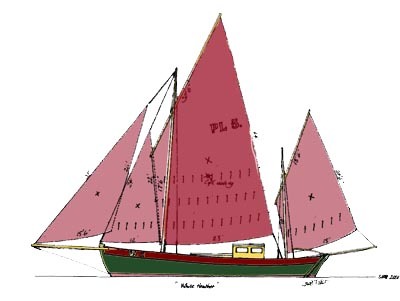 A drawing of White Heather as she would be if re-rigged with her original 'Standing Lug' (Nobby) rig. On the 26 th August 1923, George Gaskill died, the Rev E. Cubbon (Chaplain to Tynwald) remembers, with his father, visiting Gaskills sick bed. He remembers Gaskill as a tall, dark man with a large moustache, very superstitious and always wearing a peaked cap. I have met with Mrs Mahood of 29 NEW RD, PORTAVOGIE who is Palmer's daughter. She could remember as a very young girl going down to the boat at the weekend, making the bunks and cleaning the stove and in return she was allowed to drink the spare condensed milk. She also remembers WH going on fire in Portavogie on one occasion although, fortunatly little real damage was caused. I have met with Willy Williams, well known fishing historian of ARDGLASS who remembers White Heather as the first boat he ever sold oil to when his father opened an oil agency in about 1921. † He also remembers her as being noted as one of the fastest and handiest boats working ARDGLASS at the time. In C1945 she was sold to Sam McVeigh of Portavogie and reregistered B179. Norman Quillan an ex-fisherman of Port St Mary remembers fishing for cod out of Whitehaven in the 1950's, and recalls McVeigh and the White Heather fishing with the same fleet. He remembers McVeigh as a heavy drinker and prone to 'binges', so much so that at times he found difficulty getting a crew who would sail with him, so occasionally worked her alone. † At this time of course she carried no sailing rig. In 1952, in the hands of the McVeigh family, WH put to sea from Whitehaven on the night of the same storm which caused the car ferry Princess Victoria to founder in the north channel. No one in Whitehaven thought that they would ever be seen again but they made it to Portavogie, or at least the Strand near Cloghy. It is generally believed that a certain amount of 'anaesthetic' had been consumed prior to departure!. In 1953 she was sold to John Ennis, little is known of this period. In about 1957 she was sold out of the fishing to well known Belfast Yachtsman and Shipwright, Plunkett Connolly, to be converted to a Yacht. Connolly lived aboard her at Groomsport, County Down, and is said to have carried out a considerable amount of restoration work on her. She was then bought by the Hotelier family the McCulloughs, and moored at Killyleagh on Strangford Lough. Her next owner was well known Yachtsman and Marine Surveyor, Horatio Todd, who further substantially restored her, including the fitting of a new keel in 1971 (on Gallahers Slip, Belfast). For a while, after Horatio Todd's time, she languished ashore in a garden in Lisburn and deteriorated somewhat. In 1974 she was bought by John Neilly and Frank Tighe, two R.U.C. Policemen, who, after carrying out considerable work on her, re-launched on Strangford Lough . She was rigged with a Gaff Ketch rig using modified sails from another yacht which had been destroyed in a calor gas explosion . During the on-going process of restoration and modification these men added a wheelhouse and coach roof using 30ft lengths of reclaimed Mahogany, salvaged from the tables of a Belfast Linen market. Upholstery was created using seats from a bomb damaged Belfast pub. During their early ownership she had an old air cooled Lister, this was, in due course replaced by a B.M.C. † 2.2 Diesel (approx. 45HP) salvaged from a written off 'London Cab'. Her hull bears witness to her many engine installations in the numerous hull punctures from old shafts and skin fittings etc. † The B.M.C. † drives a small prop slightly offset to starboard, giving her about 6.5 knots under power. White Heather, during Frank and John's ownership was well known for being the venue for many memorable parties and 'sessions', both men being interested in Irish Traditional Music, so every summer she would go off to the Western Isles for a few weeks on a trip which featured music and drinking large on the menu. One feature which made these holidays even more pleasant was the solid fuel stove which was hand made on the quay side by a character called Joe Taylor, using ex Harland and Woolf armour plate! Joe, an engineer was also responsible for fitting the B.M.C. and for the construction of the steering gear she had when I bought her, using a worm and pinion mechanism from a fire pump! After a period of about 17 years of ownership and with the onset of ill health on the part of John, gradually they found that the boat was becoming too much for them. For a time prior to summer 1989 I had been toying with the idea of a bigger boat to replace my beloved 1936 built 28'ft 6in Bermudan Cutter 'ANADYOMENE'. I first learnt of W.H. during Manx Heritage year (1986) when I sat, as Laxey Sailing Club's representative on a sub committee advising on Maritime affairs, I found her whilst checking on the whereabouts of some of the Herring Fleet. I was in no position to do anything about it at that time but kept the information stored away for future referance. In 1989 I heard that John and Frank's situation had not improved and I thought that if she was to be sold then better come 'home' than go anywhere else, so negotiations commenced. I completed the purchase in October 1989.